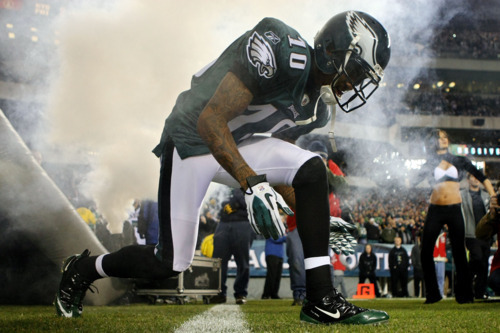 Two weeks ago, I speculated that the Eagles franchise tag and DeSean Jackson’s acceptance of it could help bring the two sides together on a long term deal. With the threat of separation and the lack of respect behind them, it appears that’s exactly what happened. Reports differ on whether Jackson actually signed the tender or not, but regardless they were able to find common ground before it came to that. From looking at the details of the contract, as reported by Pro Football Talk, it seems that both sides compromised somewhat. The Eagles came up from their absurdly low $6 million per year reported offer, and in exchange Jackson didn’t extract the maximum guaranteed money he likely could have received on the open market. 2012: $10 million signing bonus plus $1 million base salary/workout bonus. 2013: $7 million salary/workout, $4 million fully guaranteed with rest for injury only. What it comes down to, as far as I can tell, is basically a guaranteed two year, $18 million contract with three team option years in which Jackson’s paid very well in base salary but the team can move on from him if necessary. Stevie Johnson, Bills: $18 million. Marques Colston, Saints: $19 million. Pierre Garçon, Redskins: $13-18 million. Vincent Jackson, Bucs: $26 million. DeSean didn’t get Vincent Jackson money, but he slots in quite comfortably among the other top wide receivers. DJacc’s full contract over five years is bigger than the other guys, but the money at the end isn’t guaranteed, making it somewhat of a “prove it” deal for the wide receiver. If he keeps his head on straight and plays up to his potential, Jackson could make more than most of the rest of them over the life of the deal. All in all, it’s a happy day for Eagles fans. You simply don’t win in the NFL without retaining your top talent, and the Eagles came perilously close to not doing so. Now the nearly two year drama of Jackson’s status is over, and with any luck he will take to the field with a renewed purpose, showing us that his best years are yet to come. Tagged with Philadelphia Eagles, NFL, Free Agency, DeSean Jackson, Wide Receiver, Franchise Tag, Contract Extension, Front Office, Vincent Jackson, Stevie Johnson, Pierre Garcon, Marques Colston. March 15, 2012 by Brian Solomon.